WOW. Great ethnic food 5 miles from my house!?!?! I’m SO frequently surprised about stuff like this, but really shouldn’t be anymore. So far, we have found amazing Indian, Thai, Vietnamese, Greek, Mexican and now Venezuelan (although apparently it was recently sold to a Peruvian owner so there will be some changes soon) food, all within 10-20 minutes from where we live in suburban, cookie-cutter, pristine, totally non-diverse, Lakewood Ranch, FL. We were both feeling a little bored of our stand-by dinner spots, so after a hard workout, we decided to give Krispy Arepas a try. I’d read a ton of great reviews online, and it sounded like the ‘something different’ that I was craving. We walked into the neon-green painted, brightly lit, fast food restaurant. It’s got a little flair with cute, little, real and fake painted cactuses and alpaca dolls on high-up shelves. There were a few other people in there waiting- as we were told that fresh Arepas were being made and it would be about 10 minutes until they were ready. 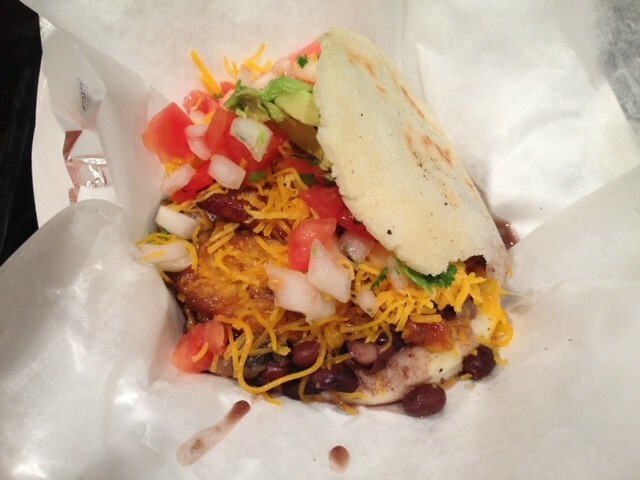 We asked the friendly guy behind the counter to tell us a bit about what Arepas are and he explained that they are sort of like a corn flatbread that are stuffed with various ingredients commonly found in South American countries. As non-meat-eaters, we were happy to see that the choices for us were plentiful, with plantains, mushrooms, beans, cheeses, avocados and other various veggies and sauces. Seeing how hungry we were, he gave us a small plate of mushrooms, plantains and a couple of the sauces to sample while we waited for the Arepas to be ready. It was actually more than 20 minutes later that we got the signal that it was finally time. He had felt so badly about the long wait that he also gave everyone who was waiting there a cup for free drinks…very nice of him, and that along with the snack more than made up for the long wait. We had him fill our freshly cut-opened arepas with pretty much everything non-meat that could fit in there, and realized that we’d basically made them impossible to pick up and eat. No problem, thats’s what little plastic forks and knives are for. We sat down and dug in to the little pockets of flavor and both loved them right away. Exactly what we wanted. A big step away from the norm, and an exciting blend of new flavors. The sweet, soft plantains, the creamy avocado slices, the cool pico de gallo and the AWESOME green, garlic, cilantro sauce combined with cheddar cheese, sauteed mushrooms, tomatillo sauce and black beans filled the crispy, chewy corn sandwiches with wonderful texture and flavor. These LOOK like they may be too small to fill a hungry belly but nope, not at all. We were full and happy by the time we cleared our plates. But wait, what’s that?? 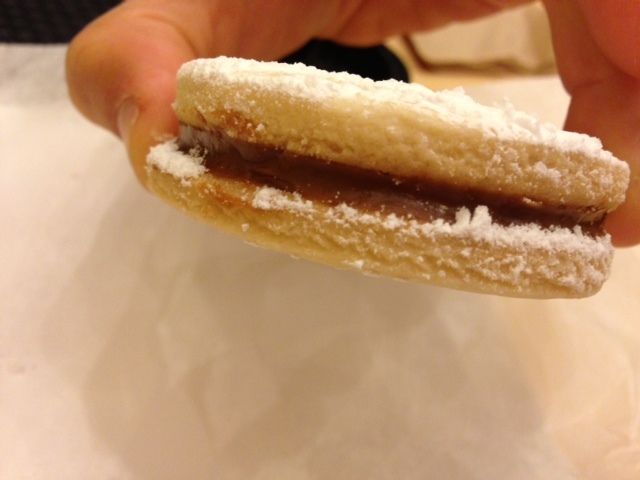 A fresh powered sugar homemade cookie filled with dulce de leche? Okay. I guess we can fit one of those in too. It wouldn’t be fair to write a review without a taste. Yum. 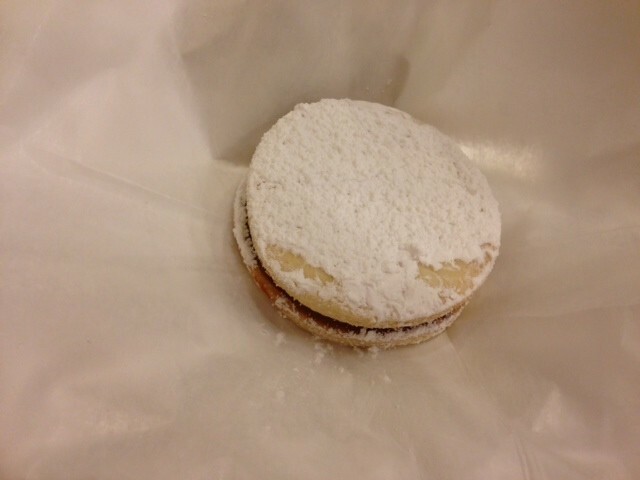 Crisp powdery cookies with a creamy, sweet, salty center? Nothing bad about that. We will definitely pay another visit soon- most likely on a Wednesday when it’s 50% off. You really can’t beat dinner for $5 a piece ($2.50 a piece on Wednesdays!!! ), especially when it tastes this amazing.